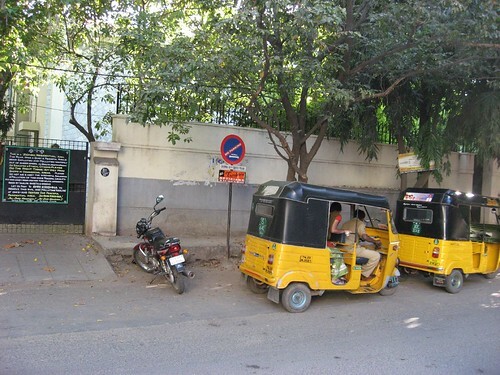 Ram Viswanathan: Zoning Laws in Chennai? 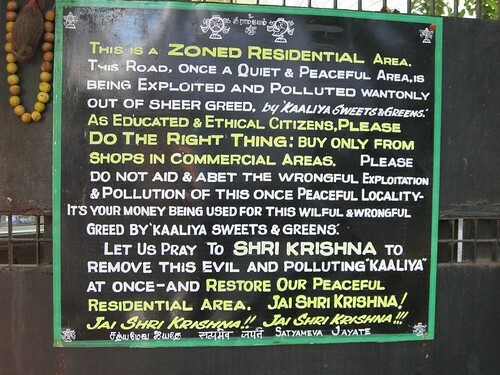 I saw this interesting board across from Suriya Sweets in Abhiramapuram. 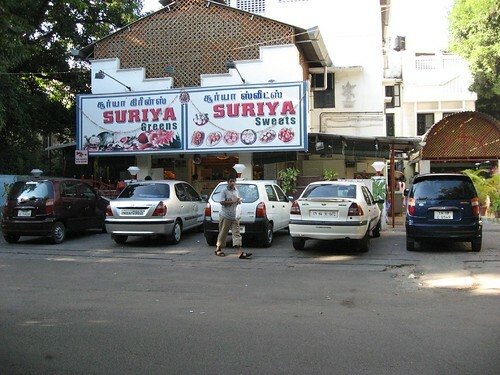 This one, apparently put up by a frustrated home owner who has been facing the wrath of increased traffic and noise pollution due to Suriya Sweets..
With limited or no Parking, the entire 'frontage' has been converted to a parking lot by Suriya Sweets.. Which is always over flowing. Even though, I understand the anguish of this hapless home owner, I wonder if there are any zoning laws in Chennai. If it is there, then it must be only in the books and minds, as there is no place in Chennai that is immune to commercial exploitation. My observation is that, any and all available place will be utilized for commercial purpose, if there is demand. Also, it is unfair to single out Suriya Sweets as there are more commercial establishments in the same street couple of houses away. So, why hit out only against Suriya Sweets? This noise pollution and traffic menace is progressively getting worse with unabated encroachment and flouting of rules. Will it get better? I doubt it..
As a MI operative we used to make life xtremly uncomfortable of VCs in the jungle by directing various freq. of sound. The VCs always vacated in a hurry. For under $100 he can make a jig which can make customers irritated and leave Red and Sour instead of Green and Sweet. Oh, one side effect for some strange reason all the red ants came out in droves out of the ground. I wouldn't know what it will to do nearby Temple elephants and the ruling monkeys! Ram: I didn't get it. Why the No Parking sign ? Looks like a perfect parking space..Is it Reserved to for Holy Cows Only ?